As warmer weather approaches, most of us turn to our air conditioners to bring relief from the heat. However, humidity can play as big a role in comfort, health and home preservation as the temperature. It’s important for homeowners to know the signs that they may need a dehumidifier. Creepy crawlers often prefer damp, dark conditions. In many homes, the crawlspace or even the basement are the perfect locations. If pests are a problem in your home, a dehumidifier in the basement or crawlspace can make your home less inviting. Perhaps the most obvious sign that moisture is a problem in your home is a damp, musty odor. The smell can be confined to the basement, or creep up into the living space from underneath the house. If you finally decided to pull the old ten speed out of the basement only to find it’s covered in rust, then moisture might be a problem. High humidity in the air can also damage wood floors, crown molding and instruments like guitars. While air conditions remove some moisture from the house, they don’t do as much as a dehumidifier. Because humidity makes us feel warmer, many homes have the air set lower than is comfortable in the winter — creating a home that is cool, but also damp. Many smaller dehumidifiers sold at retail outlets do not have the capacity to handle the damp conditions in the average size home. 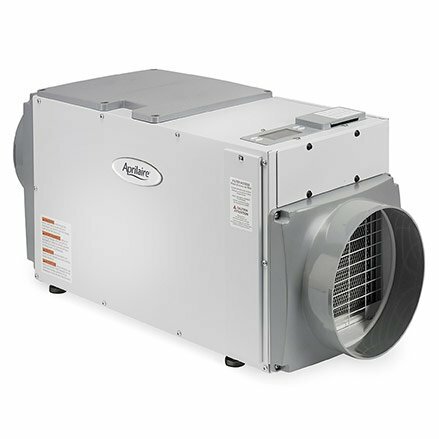 To determine the best size and installation location for your dehumidifier, find a local Aprilaire Dealer.